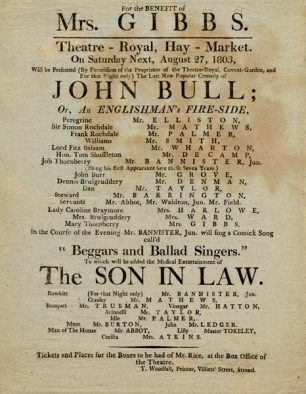 These playbills are for two performances of the show John Bull, performed at the Theatre Royal Haymarket. It was a long running show, performed alongside a changing array of secondary acts. 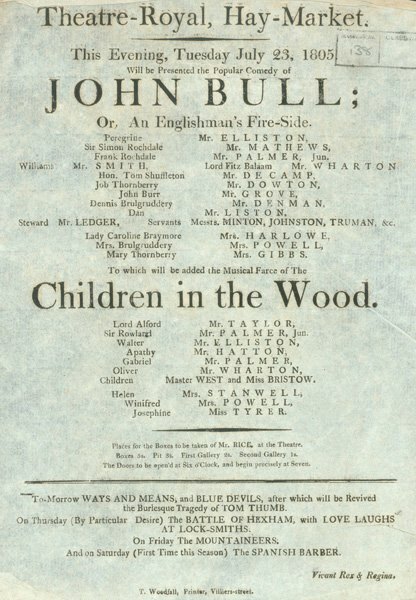 The cast included Mrs Gibbs as Mary Thornbury (the female lead), William Elliston as Peregrine (the male lead) and Charles Mathews as Sir Simon Rochdale (the main antagonist). 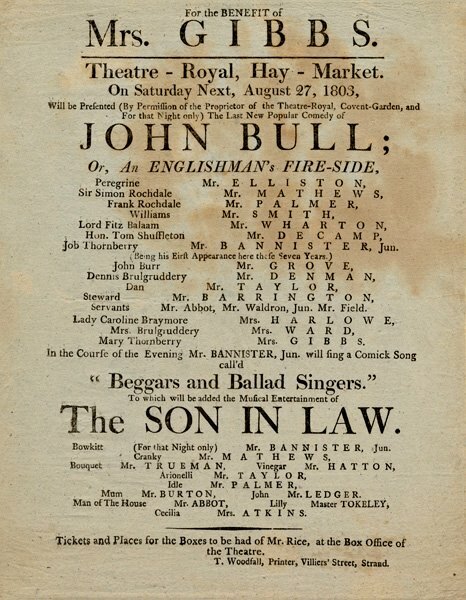 They have been preserved in our collection in the Broadley Haymarket collection, Vol. 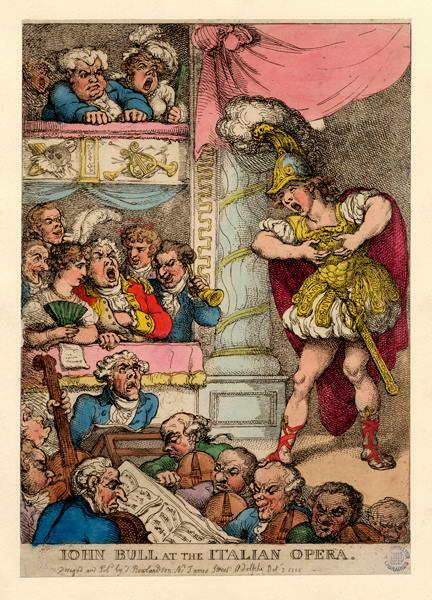 III The Little Theatre p345, and in the Theatre Collection. 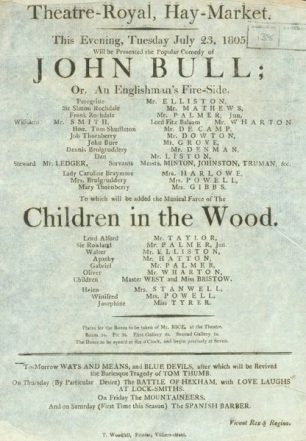 Although the name would suggest a connection to the infamous caricature John Bull (shown in the third image “John Bull at the Italian Opera”) upon reading this comedy play in full, I had realized that it has little to do with the historical cartoon of “John Bull”, other than mentioning him a handful of times. It is a comedy drama, where many characters attempt to achieve their own desires even when it affects another character severely. Such as the female lead runs away from home to see her lover one last time, which leads to her father to extreme acts of distress (ie. Selling his fairly successful shop) until he finds her again. In true dramatic fashion, the story begins with two young adults who are madly in love with each other; however the young man is betrothed to another and must leave the young woman to marry his fiancé. The plot begins to pick up when the betrothed woman starts to fall in love with this traveling Englishman man who had lived in India for many years. Frank: Good heaven! Why—why are you here? Mary: I don’t come willingly to trouble you; I don’t indeed! Frank: What motive, Mary, has brought you to his house? And who is the stranger under whose protection you have placed yourself, at the house on the heath? Surely you cannot love him! Mary: I hope I do. Frank: You hope you do! Mary: Yes;– for I think he saved my life this morning, when I was struggling with the robber, who threaten’d to kill me. Frank: And had you taken no guide with you, Mary?—no protector? Mary: I was thinking too much of one, who promised to be my protector always, to think of any other. Frank: Mary—I –I – ‘twas I, then, if seems, who brought your life into such hazard.